You use the settings in the various steps of the wizard to set the look of the galleries you generate. Some settings can be set separately for thumbnails pages and details pages; others, on the other hand, are global. You can immediately view the set of Web pages you've created in a Web browser, save it to disk, or immediately upload it to an FTP address of your choice. Most of the gallery templates are multi-level. This means that clicking a thumbnail in such a gallery opens a new page with a larger view of the relevant photo, and, in some galleries, you can also have a link for a full-resolution view. Thumbnail pages are automatically linked to each sequentially in order to show as many thumbnails as are needed to show a thumbnail for each photo while maintaining the numbers of thumbnail rows and columns you've set. Galleries created in Zoner Web Gallery can capture readers' interest with unusual elements such as rotated photos within thumbnails. 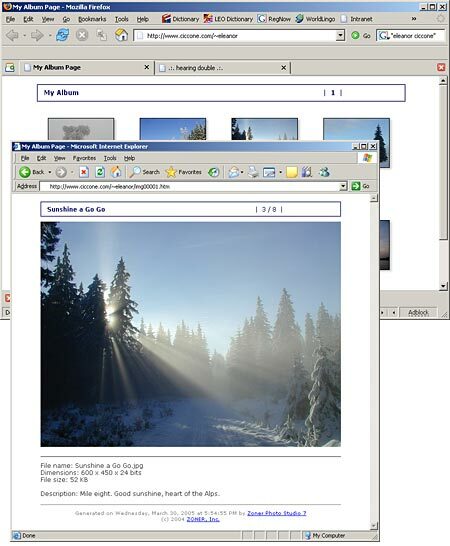 Once you've created a gallery, you can immediately send it off for presentation on the Internet via an FTP server of your choice, without using other programs. You will need to enter your login data to connect to the hosting server.